Will do as soon as the brackets are mounted. Last edited by Kaptein Jack; 2019/02/14 at 07:47 PM. Maybe picture of brackets holding the awning pse. I made my brackets to fit on the canopy. 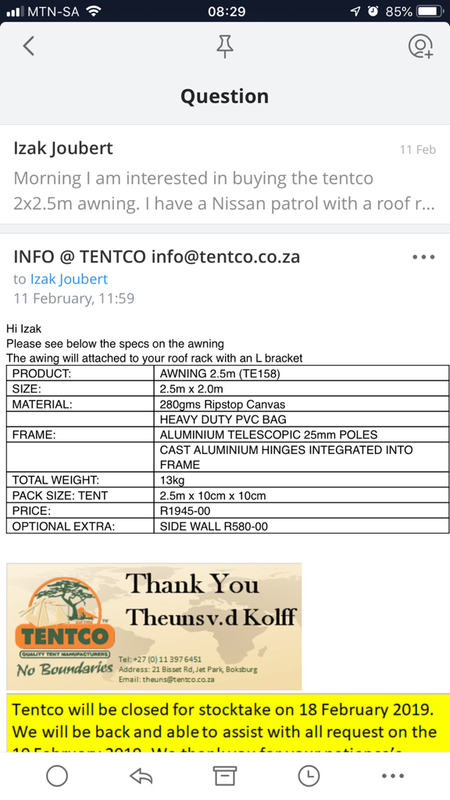 I phoned Tentco to inquire about the size of the awning and was told it rolls out 2.5 meters and it runs 2 meters along the side of the car. Can anyone please clarify this? I want to know as well. I keep on getting different answers to this question. So looking at the pack size I take it that it must be 2.5 meters along the length of the vehicle. Pity, I would prefer it to roll out to 2.5 or even 3 meters. 2.5 meters along the vehicle just measured and 2.0m out. Leisure Awn from Howling Moon has both the sizes you are intending to buy. I'm in a same situation, confused though. You can get Tentco awning and side walls for the price of Leisure Awn awning only. Can one still get howling moon? Did they not go the way of the dodo with jurgens? Last edited by Kaptein Jack; 2019/02/15 at 04:36 PM. Last edited by Kaptein Jack; 2019/02/15 at 04:40 PM. Can you set it up by yourself comfortably? Yes, can do..but with two people it should take two minutes! Can't believe how expensive these awnings are here in South Africa. Just came from Australia and saw the same size awnings for less than R1000... too bad I couldn't fit it in my luggage.